I love theme parties. It’s the excuse I need to dress up in costume or cook something weird. So I’m obviously getting excited about the upcoming Academy Awards. The nominations were announced this morning at the Samuel Goldwyn Theater in Beverly Hills at 8:30am EST. 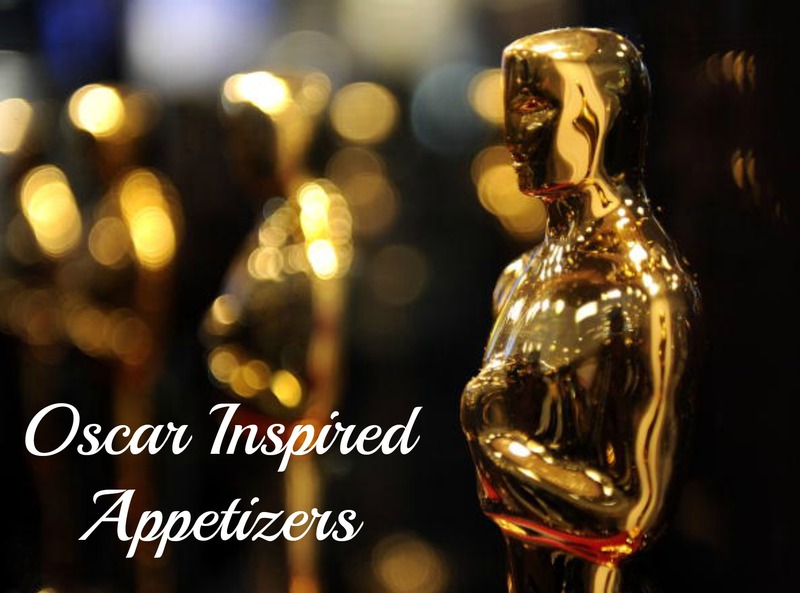 Oscar watch parties are a fun excuse to indulge my fascination with celebrity culture and to develop new thematic recipes. 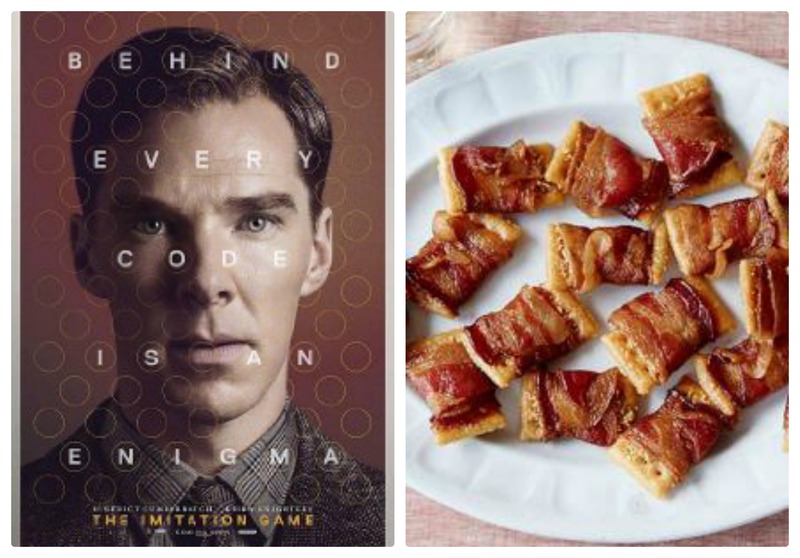 Every year I like to come up with appetizers inspired by nominated films. 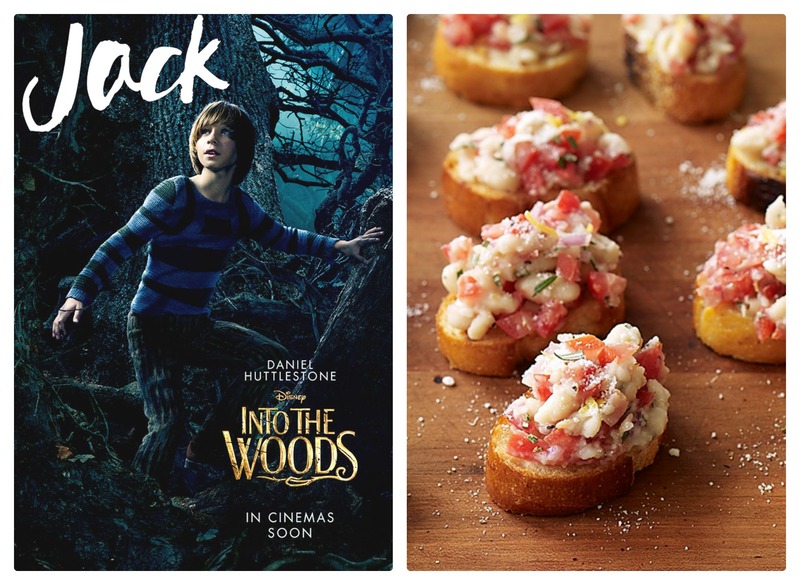 This year, I created three recipes representing Into the Woods, The Imitation Game, and The Grand Budapest Hotel. While Into the Woods didn’t receive many nominations, I’m doing it for Meryl! Into the Woods, probably the most famous Steven Sondheim musical, was brought to big screen this year by an incredibly star-studded cast including Emily Blunt, Meryl Strep, and more. The film conglomerates major fairy tales into one storyline, telling them first traditionally and then retelling them from a darker perspective. Nick and I went saw it last weekend and left throughly entertained. Nick, my trained opera singer of a husband, even said that Meryl Strep sung her role as well as anyone he’s heard. Jack was one of my favorite characters, so I came up with this recipe in his honor. Combine all ingredients with the exception of the bread and one clove of garlic. Taste and adjust seasoning as needed. Use the back of a spoon to smash some of the beans so the mixture sticks together a little bit better. Slice the remaining garlic clove and place in small bowl with some extra olive oil. Toast or grill bread slices, brushing one side with the olive oil. The garlic is intended to flavor the oil, and shouldn’t be brushed onto the bread. Spoon some of the mixture onto the bread and arrange on a serving tray. The Imitation Game is based on the true life story of mathematician and cryptanalyst Alan Turing. Turing was a key part of cracking the Nazi code during WWII. The sad part is that while he played a key role in helping the Allies win the war, he was later criminally prosecuted for being gay. Mil and I are actually seeing the movie tonight. I can’t wait for an evening with Benedict Cumberbatch! Preheat the oven to 250 degrees. Lay the crackers out on a baking sheet. Sprinkle some parmesan cheese onto each cracker – as little or as much as you’d like. Cut each piece of bacon in half. Wrap carefully half strips of bacon around each cracker; you don’t want the cheese to fall off. Bake in the oven for approximately two hours, and then serve. Make sure to watch the bacon and the timer, as I’ve burned a batch before. Finally, The Grand Budapest Hotel was one of my favorite movies of the past year. I am a sucker for Wes Anderson films. His movies have so many subtle details that I can watch them over and over and still see something new. 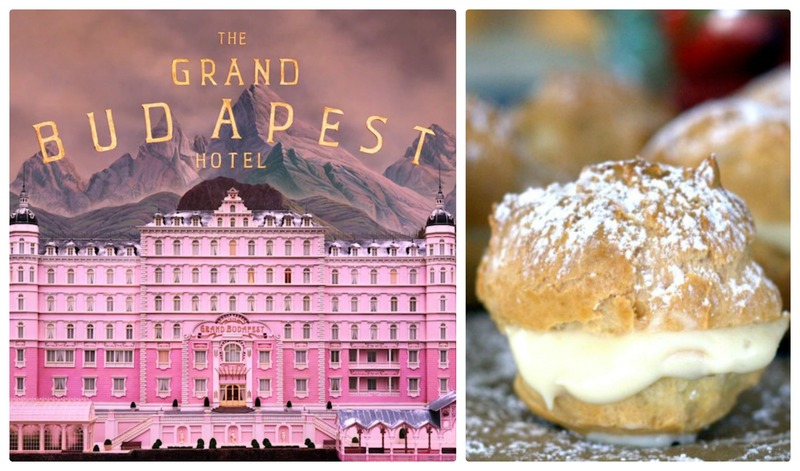 Pastries play a critical role in the movie, specifically the courtesan au chocolat from the fictional Mendl’s Bakery. The recipe for this gorgeous desert, invented for this film, basically involves creating three sizes of cream puffs, stacking them one on top of the other, and then icing or glazing the layers in pastel hues. Delicious sounding and looking, but a little more work than I’m interested in putting in forth for a fairly casual party. I mean, how fancy can a TV watching party get? So instead I asked my friend’s mom for her profiterole recipe, which features an Italian twist. Preheat oven to 425 degrees F. Put the water and butter in a large pot and bring to a rolling boil. Once boiling, stir in the flour and salt until the mixture forms a ball. Scoop the dough into a stand mixer, and beat in the eggs one at a time. Make sure you mix the dough well after each egg. Use a tablespoon to drop even-sized scoops of dough onto an ungreased baking sheet. Bake for 20-25 minutes in the oven until golden brown. The centers should be pretty dry. While the shells are cooling, prepare the filling. Mix all of the ingredients together in a bowl, and voila you have your filling! Use a serrated knife to cut off the upper 1/3 of the cooled pastries, making sure the tops remain intact. Use a small spoon to scoop out some of the center, making sure to remove any dough that is still soft. Fill the small hole with the ricotta mixture, and place the pastry top back on. Repeat until every one is done. If you want to take them to the next level, drizzle some melted chocolate on top. YUM! I cannot wait to try all of these!! YUM. What a creative post. I am not much of an entertainer but do love to watch movies. I haven’t seen any of the ones you mentioned, I will add them to my list. My husband also loves Wes Anderson films so we will probably start with The Grand Budapest Hotel.